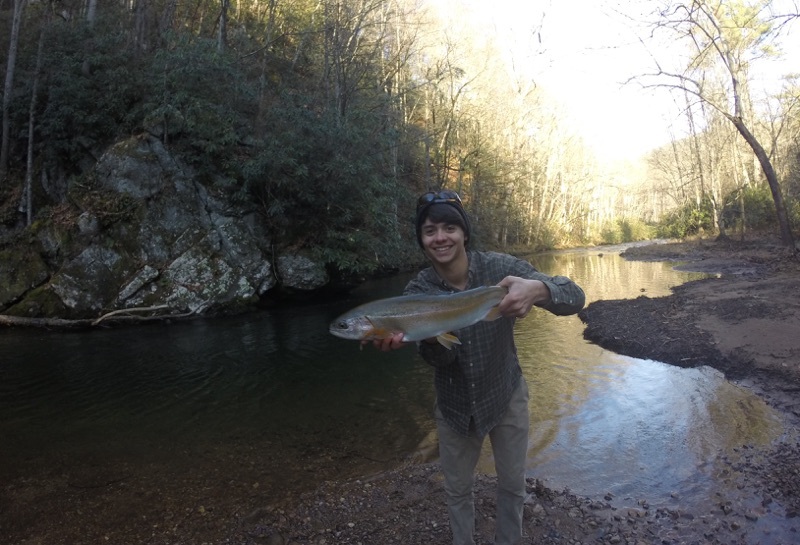 This morning, my little brother Ewing and I went down to the North Fork of the Rivanna River "behind" our house (1/2 mile or so) to fish with some skein I prepared from the stockers we caught on Saturday. The rigs we used were #10 egg hooks with 2 BB split shot about 6 inches to 1.5 feet above the hook, fished under a trout magnet float so it would drift the skein along the bottom and keep the splitshot above bottom. The reason for various distance between the hook and shot was in order to keep the bait on the bottom depending on current, too close to the hook in slow water and your drift is too slow, too far away from the hook in fast water would leave your skein a foot deep trailing behind the bobber. We started off fishing some riffles and runs in 1-3 feet of water, picking up 3 or 4 fish ranging from 6-8 inches, no monsters, but a sign that they liked skein. The next pool we fished produced a better 8 or 9 inch fish for Ewing on some trout belly meat preseved with the skein, a couple 6-8 inchers, and I landed an 11 or 12 inch fish, the biggest of the day, and he put up a very good fight. We continued on downstream, and caught a few more 6-8" fish, missing a couple fish that probably would have gone 9-10". We could see every fish we "rolled" because the water was especially clear today. We fished up the river, only landing one more 8" fish, in a 200 yard stretch with excellent holes. This is common in cold weather however, I don't know why, but it is either a hit or miss from pool to pool. We ended up finding one more good hole with a decent number of fish, so I switched to a 1/32oz white marabou jig tipped with a 3" white floating trout worm. Again, all 6-8" fish, but better than no fish at all. Normally in the fall/winter/early spring fallfish "season" for us, we catch numerous 10-12 inch fish, the biggest we have ever landed probably being a 14 or 15 inch fish, but those are very rare here. So if you have fallfish in your area, grab your trout tackle and give it a go. They love flies as well, heavy streamers with lots of "flow" to them (marabou action) will outfish mostly everything, but they will take nymphs and dries. In terms of spinning gear, light 2-6lb line, small hooks with worm/cutbait/powerbait/salmon eggs work great drifter on or near the bottom is your best bet, if the fish are sluggish, go to carolina rigs in deep water. Brightly colored baits are key, so salmon eggs and powerbait are good options. If you want to only catch bigger fish or don't want to bother with bait, any lure used for trout and panfish tends to work well. Small ones will hit lures but you are less likely to catch them because they will simply "peck" at it. The #1 best lure is a 2" white berkely powerbait curly tail grub with a 1/16 oz jighead, slays them no matter what the conditions are. My other favorite is a 1/32 or 1/16oz marabou jig (or a jig simmilar to the "slab daddy" crappie jigs) tipped with a 1-3" artifical worm (artificial, preferably floating) either white, pink or natural worm color. They aren't bad table fare either, filets breaded in cornmeal and fried in flour, all the bones dissolve and it is a very mild and flaky fish. Well thats all I have to say about "chubs", thanks for reading! A little smaller than average fish today, but the first. This picture is edited, but I had to do it because my phone doesn't like the silvery sides of fallfish very much. Still looks pretty cool in my opinion though. Fallfish and the camera on my phone just don't mix very well. Small fallfish will eat big baits. This was an average sized fish for the day... "Slim pickins"
This photo is not edited at all, same big fish, phone decided it wasn't too silver this time.